Join Australia's best quality share market social network to discuss - NUHEARA LIMITED and other ASX listed companies. Cracker of an announcement today from Nuheara that its been selected by the UK’s National Health Service (NHS) to provide the agency’s hearing solutions for adults and children with mild to moderate hearing loss. I just saw this announcement from Nuheara that I missed at the end of last week. Says that Farjoy has increased its stake in the company to 7.9%. Thats a huge vote of confidence for the business’ outlook given Farjoy has investments in WH Soul Pattisons, TPG and a bunch of other solid companies. I haven’t had any luck with micro cap stocks- but I may jump back in NUH with a small parcel that I’m prepared to hold long term, having seen this. For me, it’s finally a green light. Not at all surprised that Nuheara has gone into a trading halt to complete a capital raise. With the growth they are looking to fund expanding into international markets, I always expected this was coming. I suspect it’s the reason the share price has struggled to sustain any upward momentum, despite all the positive initiatives released by the business over the past 3 months. 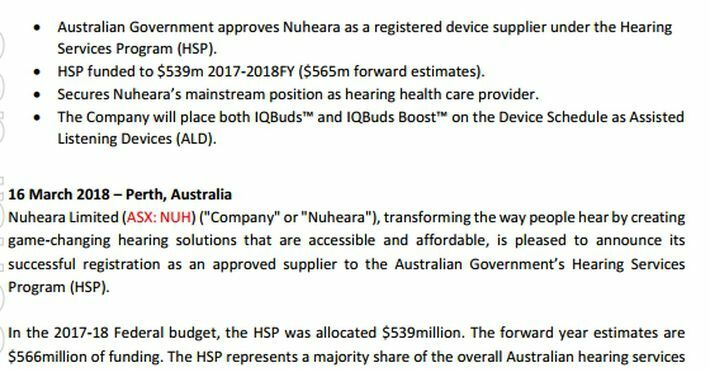 Impossible to know why as there has been no announcement from the company other than the excellent announcement a month ago that the Australian government had registered Nuheara to its $539 million hearing program. There was also the more recent the announcement that they've strengthened their management team. The only thing that would make sense about the current movement in share price is if there's a capital raising that's imminent......and there are people in the market who know this is coming. Nuheara webinar is on right now! This should be well worth listening to. Nuheara hosting live webinar Wed 11th and Thur 12th April. CEO to go through everything you'd want to know about the company. Further to my earlier post on Nuheara, this article in the Fin Review in June 17, which covers their $9 million capital raising, provides additional colour on the potential for this business. I love the fact 10 institutional investors participated in the raising, including Wilson Asset Mgt, one of the top fund managers in the country, as it’s rare for an institutional investor of that calibre to invest in early stage companies. And I love the worldwide distribution potential through retailers and hearing clinics, which seems achievable based on the household name retailers this article says they’re selling though- like Best Buy, Brookstone and Target In the US. 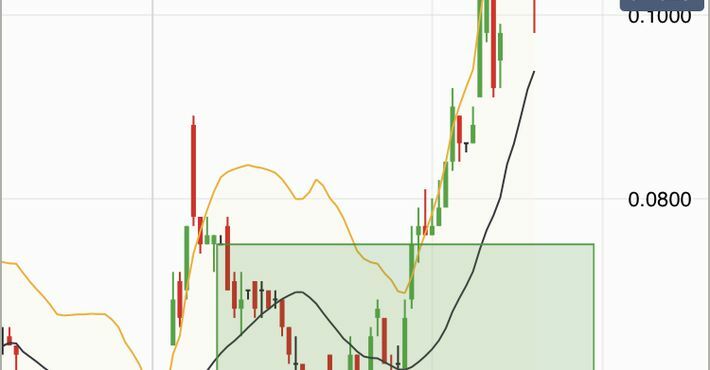 Other Fin review article in Jan 18 shows the strong uptake of their product in the 30 June 2017 financial year- delivering $2.5 million of revenue after only selling for 6 months and mentions the strong uplift on revenue they’re expecting in the 2018 financial year off the back of two new products that have been launched.